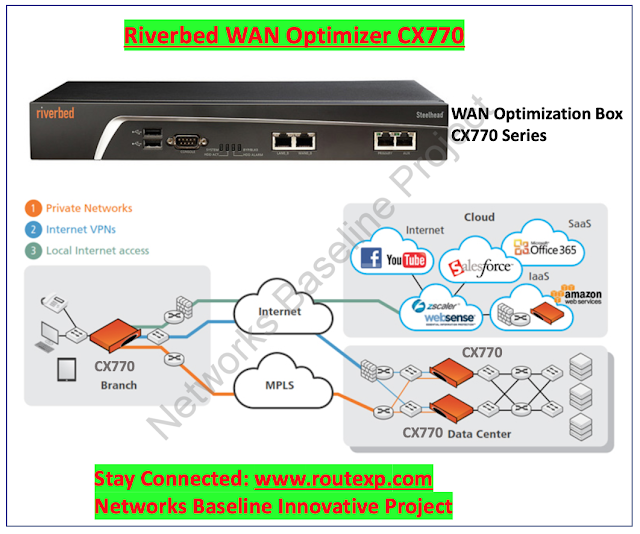 Today I am going to talk about the Riverbed Steelhead CX770 WAN optimizer. It is one of the dedicated appliance for WAN optimization and is widely used in many of the enterprise networks now a days. Riverbed Steelhead CX delivers the best of application performance and break the barrier, helping you bring on your application SLAs, while also optimizing networking budgets. With the new innovation and excellence customer needs to optimize communication with a distributed fleet or an enterprise building out your private cloud, the Riverbed’s Steelhead CX series brings the performance and ROI obligatory to confirm the needs of the customer. It has three different modes and these modes are Low, Medium and High which varies with the capability range. With the use of low and medium, you can get the optimized WAN capacity of 10 Mbps while with the use of the high range you can get this optimized WAN capacity of 20 Mbps. The optimized TCP and UDP flows for these are 900 for Low, 1500 for Medium and 2300 for High Range appliance. It can support up to 45 Mbps of Qos Bandwidth. You can have 1000 Qos rules implement of CX770 model. What are the key benefits of the Riverbed CX770 WAN optimization appliance ? Conclude the optimal path for each application to rapidity transfer across the WAN and other networks. Decrease response times to sort implementing virtual servers, desktops, and applications quicker and simpler than ever. Decrease bandwidth consumption up to 80% thus complying expensive network bandwidth advancements and it can supports up to one million connections. Upsurge throughput and number of connections in one box by up to 50% and Stability traffic across private and public links by balancing it through various methods. You can Implement the whole setup in minutes without alterations to applications, users, routers, or other IT infrastructure. Spontaneously discover and report on applications in use across organisation. Achieve current management throughout the mighty web-based and command line interfaces, including in-depth reporting and NetFlow exporting and Improve data protection efforts with a faster WAN. Remove your remote backup structure and progress replication up to 10 times and more, while decreasing the cost and complication of your WAN infrastructure. Features the uppermost volume all SSD-based WAN optimization controller. Contains a full range of SSD-based appliances model for large branch offices and data centers.